Following the brilliant final chapter that the Lake Oswego football team wrote on Saturday — their 34-27 win over Sheldon in the Class 6A state championship game — it is only fitting that we take a look back at how the story started. So join us here in a week-by-week walk back through one of the two greatest seasons in Lake Oswego's stories history. Now that's how you open a season. The Lake Oswego football team, coming off a 2017 Three Rivers League co-championship and Class 6A state semifinal appearance, hit the ground running (and passing) on Friday, rolling past West Salem 48-21 in non-league action at Lake Oswego High School. In his first varsity start, senior quarterback Jackson Laurent went 18 of 29 passing for 298 yards and five touchdowns with one interception. Casey Filkins made four catches for 90 yards, while Thomas Dukart added five catches for 78 yards and three TDs, and Joe Hutson made two grabs for 61 yards and two scores. On defense, Matt Sebolsky, Keenan DeRaeve and Filkins all made interceptions. In one sense, Friday's Lake Oswego at Jesuit football game was just another game. But in almost every other way, it was so much more. The Lakers piled up a 20-0 lead, shut the Crusaders out for 39 minutes, 22 seconds and eventually posted a 20-14 win at Jesuit High School that marked Lake Oswego's second straight victory over Jesuit. For the game, Collin Bracken ran 16 times for 118 yards and one TD, quarterback Jackson Laurent went 14 of 20 for 152 yards and one score, and Casey Filkins made two catches for 49 yards and one touchdown. Joe Hutson came through with the game's only turnover, picking off a pass by Jesuit's Will Spitznagel. It didn't take long for Friday night's Oregon City-Lake Oswego football game to turn into "The Casey Filkins Show." All the Lakers' 5-foot-11, 185-pound junior wide receiver needed was the football and a little running room. After that, the only thing left to see was the back of his No. 9 jersey. Filkins scored on touchdown catches of 65, 46 and 35 yards, and TD runs of 12 and 4 yards, leading the Lakers to a 63-17 Three Rivers League rout over the Pioneers at Lake Oswego's Cobb Field. Filkins ran twice for 16 yards and two scores, and also caught five passes for 190 yards and three more TDs. Collin Bracken ran wild, too, carrying 13 times for 210 yards and two scores, while quarterback Jackson Laurent went 11 of 17 for 272 yards and three scores. On defense, both Connor Willihnganz and Thomas Dukart recovered fumbles for the Lakers. Clackamas' Richard Kennewell didn't just catch the football in the right corner of the end zone. The Cavaliers' junior wide receiver was as far back at the end of the end zone as a player could get without being out of the end zone. Actually, he might even have been a few inches beyond the back of the end zone. But there is no video review in high school football. The ruling on the field was that Kennewell hauled in a 9-yard touchdown pass from Caleb "C.J." Jordan for the go-ahead score with 22 seconds to play, putting the No. 2 Cavaliers in front in what turned out to be an improbable 49-39 non-conference win Friday over the top-ranked Lake Oswego Lakers in a battle of Class 6A heavyweights at Clackamas High School. For the game, quarterback Jackson Laurent went 17 of 36 passing for 294 yards with two touchdowns and one interception. Collin Bracken rushed 11 times for 141 yards, Casey Filkins had two rushing TDs along with four catches for 101 yards and another score, and Thomas Dukart had five catches for 97 yards and one TD. Coming off a disappointing 49-39 loss to defending Class 6A state champion Clackamas, Lake Oswego faced an intriguing home matchup Friday night versus Liberty, one of the newest members of the state's largest classification. The Falcons, meanwhile, were eager to test themselves against one of the state's powerhouse programs. They got off to a promising start, too, driving the ball inside the 10-yard line on the game's opening drive., But in what was the theme of the night for the visitors, Liberty did not seize the opportunity, fumbling the ball away on first-and-goal. Two plays later, Lakers quarterback Jackson Laurent connected with Thomas Dukart on a 5-yard hitch that the junior wide receiver turned into an 86-yard touchdown and set the table for LO's eventual 45-13 victory. For the game, quarterback Jackson Laurent went 15 of 22 passing for 306 yards and four touchdowns, with Marshall McGuire making two catches for 45 yards and Casey Filkins four grabs for 38 yards and two scores. 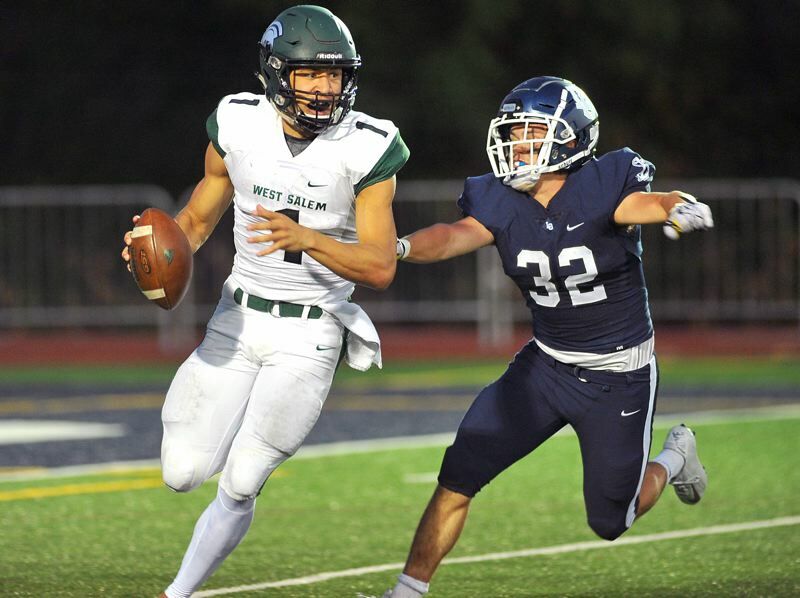 The West Linn football team may have struck first on Friday, but Lake Oswego struck back — and struck back hard — the rest of the night. The Lakers, after falling behind by a touchdown early on, ripped off four unanswered TDs and used that fast start to fuel their 41-28 win at Lake Oswego High School. For the game, Casey Filkins carried 32 times for 175 yards and one touchdown, while quarterback Jackson Laurent completed 16 of 23 passes for 245 yards and three touchdowns, with Thomas Dukart making eight catches for 135 yards and one score. On defense, Marshall McGuire recovered one West Linn fumble and Joe Hutson came up with the game's lone interception. On paper, the Canby football team had its work cut out for it when it squared off with top- ranked Lake Oswego on Friday. Canby had yet to find its way into the win column this season, while the Lakers had only stumbled once, against defending state champion Clackamas in a non-league contest. On the field, the Cougars' fears proved well founded — the Cougars could not overcome the explosive Lake Oswego offense and dropped a 33-12 decision at Canby High School. For the game, Casey Filkins rushed seven times for 78 yards and three touchdowns, quarterback Jackson Laurent went 7 for 9 passing for 103 yards and one TD, Emmet Daly led LO receivers with three catches for 46 yards, and Matt Sebolsky had an 80-yard kickoff return for a TD on the game's first play. On defense, both Chris Todd and Jonas Hunter had interceptions — Todd with a 54-yard return — and Brandon Roberts recovered a fumble. The Tualatin High School football team was fired up from the start. The Timberwolves, in their game with Lake Oswego, jumped out to a quick 14-0 lead and they went on to claim a 21-13 advantage at the end of the second quarter. That put the Lakers in a position they haven't been in all season — on the losing end of the score at halftime. They didn't like it, and they did something about it. The motivated Lake Oswego squad came up with big plays on both sides of the ball in the second half, as it rallied to score a 28-21 win over the Timberwolves in a Three Rivers League battle played Friday at Tualatin High School. For the game, Filkins carried the ball 19 times for 126 yards and three scores, Laurent connected on 16 of 23 passes for 237 yards and one TD, with Thomas Dukart making four catches for 132 yards and one touchdown. On defense, Joe Hutson picked off one Tualatin pass, while both Mario Pronnarongvat and Bryson Breeze both recovered fumbles. There was a lot of scary stuff going on at Lake Oswego High School on Friday night. First, there were a ton of high school kids in zombie costumes. Second, there was the worst weather of the fall season. And finally, there was a power outage that plunged Lake Oswego's Cobb Field into total darkness two minutes into the third quarter of the Laker-Pacer football game. But none of those things qualified as "the scariest" item of the night. Not even close. That honor went to Lake Oswego junior running back Casey Filkins. Filkins, running behind his talented offensive line, carried the ball 39 times for 325 yards and four touchdowns to help beat the Pacers 30-14 and secure the 2018 TRL title. In addition to Filkins' rushing exploits, quarterback Jackson Laurent went 5 for 9 passing for 48 yards, with Filkins making three catches for 31 more yards. The top-ranked Lake Oswego football team was far, far from perfect in its Friday night Class 6A state playoff opener. On the plus side of the ledger, the Lakers were also far, far, far, far from losing. In the end, Lake Oswego shook off a slow start to blow past 32nd-ranked North Medford 42-6 at Lake Oswego High School. For the game, Casey Filkins rushed 11 times for 75 yards and one touchdown, Keenan DeRaeve added seven carries for 53 yards, quarterback Jackson Laurent completed 17 of 27 passes for 269 yards and four scores, with Joe Hutson making two catches for 65 yards and two scores, Jacob Ferbache caught three balls for 50 yards and one TD, and Chris Todd three grabs for 48 yards and another touchdown. Hutson and Todd also came through with interceptions in the victory. Nothing can better express what the Lake Oswego football team did in its Friday win over Oregon City. The Lakers, hosting the Pioneers in the second round of the Class 6A state playoffs, dropped 49 points on Oregon City in the game's first half, then coasted home from there to win 49-14. With Casey Filkins on the shelf resting an injury, Keenan DeRaeve stepped up to rush seven times for 132 yards and two touchdowns, quarterback Jackson Laurent connected on 13 of 17 passes for 229 yards and three touchdowns, with Chris Todd making four catches for 70 yards, and Joe Hutson, Thomas Dukart and George O'Brien all catching touchdown passes. On defense, both Marshall McGuire and Malcolm Williams recovered fumbles, McGuire returning his pickup 55 yards for a score. The Central Catholic football team just kept knocking on the door Friday night at Lake Oswego. Central Catholic had the ball with a chance to take the lead three times in the second half of their Class 6A state quarterfinal against top-ranked Lake Oswego, but the Laker "D" was not about to let this one go. Those possessions resulted in two three-and-out possessions and a failed fake punt, results that helped lead the way to Lake Oswego's 35-24 win at Lake Oswego High School. For the game, Casey Filkins carries 17 times for 134 yards and three touchdowns, Keenan DeRaeve added 10 carries for 57 more yards, quarterback Jackson Laurent hit on 16 of 19 throws for 250 yards and two scores, with Filkins catching seven passes for 119 yards and one TD, and Thomas Dukart another four for 62 yards and another score. On defense, Dukart came up with the game's only turnover, an interception. For the game, Collin Bracken had 10 carries for 52 yards, Filkins another seven rushes for 50 yards and one TD, quarterback Jackson Laurent went 16 of 25 passing for 246 yards and two scores, with Filkins catching six passes for 95 yards, Jack O'Brien catching one pass for 46 yards and a score, and Thomas Dukart grabbing four passes for 42 yards and another score. On defense, Joe Hutson and Matt Sebolsky both made interceptions to help beat the Crusaders.